The main objective of this chapter is to detect the impacts of FDI and foreign trade on the economic growth of middle income countries. 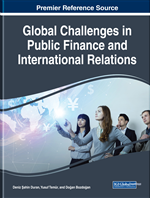 Therefore, this study aims to examine the relationship among economic growth, foreign direct investments, and trade in 27 middle-income countries according to the United Nations (UN) classification through panel data analysis method. According to the results of the Pedroni cointegration test, the null hypothesis suggesting no cointegration among the series at 1% significance level is rejected in all seven tests. According to pooled mean group estimator estimation results, the coefficients of foreign direct investment and trade which have long-term impacts on economic growth are also identified. Accordingly, the coefficients of both variables are statistically significant. A 1% increase in foreign direct investment and trade increase economic growth by 0.24% and 0.02%, respectively. The Geographical Explorations had provided tremendous opportunities for countries which could have benefited from them. Countries with advanced maritime and navigational capabilities had acquired new territories and their opulent resources. Besides using these resources as a provenience of labor in order to boost their production, they also utilized them as a market for the products they produced and eventually they constituted contemporary developed countries. Countries which lacked the ability to benefit from the Geographical Explorations and the Industrial Revolution have formed the group of developing countries. As soon as the globalization phenomenon began with the Geographical Explorations, the free circulation of goods and services was facilitated first and then it was followed by the financial liberalization movements towards the end of the 20th century. Developing middle-income countries had been the ones with insufficient capital accumulation and savings in particular. Most of those countries need external capital movements to overcome structural bottlenecks and finance development processes. The emergence of international financial movements due to financial liberalization is of great importance in eliminating this shortcoming of the middle-income countries. International financial institutions and other countries with surplus savings are the first resource options that the middle-income countries consider in coping with their shortcomings. Besides these two options, foreign capital inflow is the most crucial external financing resource. As a result of the wide-spreading financial liberalization practices in both developed and developing countries along with the globalization process, capital movements increased, and foreign capital inflows accelerated especially toward developing countries. Capital movements are characterized as either the short- or the long-term, depending on the length of stay in the host country. The short-term capital movements are portfolio investments by which foreign investors buy bonds and stocks in the capital market of the host country. Since these investments are highly sensitive to the rate of return and risk factors among the countries, they may leave the country upon the occurrence of extraordinary risks as quickly as they enter. The long-term capital movements are foreign direct investments (FDIs), which are made by purchasing a company in a host country, providing foundation funds for a newly established company, or increasing the capital of an existing company. It takes time for these investments to enter the country and to exit from the country as well. Due to the physical presence of certain components belonging to foreign direct investment such as personnel, equipment, and buildings within the boundaries of the host country, the investor cannot leave the host country immediately. On the one hand, the increase in foreign capital inflows contributes to the capital accumulation of the developing countries, but on the other hand, they create significant problems. These problems, which lead to countries becoming vulnerable to crises, are mostly the result of the short-term investments. The crises that created global impacts such as the European Monetary Zone crisis, the Asian crisis, Malaysia crisis, the Russian crisis, the Argentine crisis, the Brazilian crisis and the Turkish crisis of 2001 are thought to trigger the short-term capital inflow and outflow. Foreign direct investments, by courtesy of their long-run nature, tend to be more reliable than other sources of funding in fulfilling the foreign financing needs of developing countries. These investments have other positive effects in favor of the host country, such as increasing production/export capacity, creating jobs, and providing technology and transferring of knowledge. As the foreign direct investment’s contribution to the country’s economy becomes undeniably crucial, developing countries have begun to take some measures to attract foreign direct investment, such as the liberalization of markets, making promotions and providing incentives.